1. Gregg Allman looks like the kind of people he sings about. This isn’t meant in a disparaging way. The man just has a lot of miles on his face – character lines, you could call them. And you feel that each line and crag in that face could tell a hundred stories. I’m not sure if Mick Jagger lives a single line in any of his songs anymore. But you get the feeling Gregg Allman still does. “I don’t own the clothes I’m wearing, and the road goes on forever.”2. The Allman Brothers Band is one of the few bands left that start a show the Grateful Dead way: stroll on stage, pick up instruments, fiddle with the amps for a couple of minutes, and start playing. They don’t burst out with an opening number a la the Rolling Stones or pretty much every other band in creation. They just start playing. Unlike the good old Grateful Dead, though, they don’t really need a first set to feel their way into a groove. The groove is pretty much there from the get-go.3. 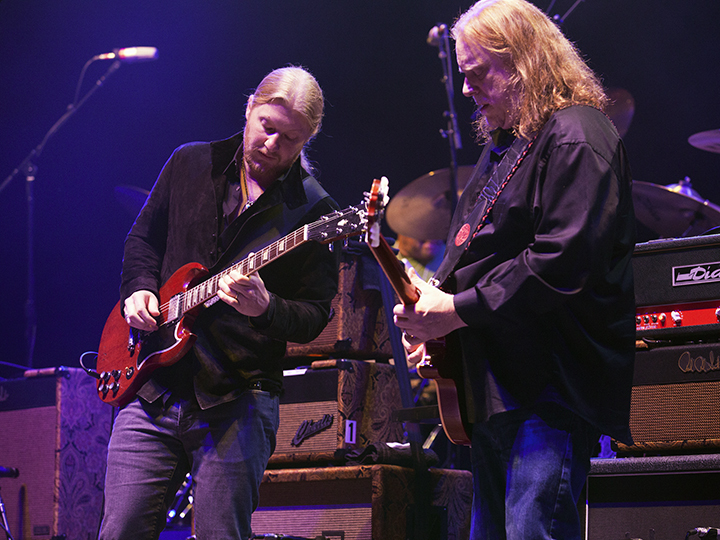 Warren Haynes and Derek Trucks play better together in concert than any other pair of guitarists out there. There may be better individual ax men around – although both these guys surely belong in any Top 20 list – but as a pair? It’s hard to come up with two names I’d put above these guys right now. It looks effortless, but you know it’s not. 4. Revival. Live, on a late summer’s night. In an open-air venue. Worth the price of admission, by itself. Everyone who likes rock and roll should see this song live at least once before they depart. 5. Killer cover of The Weight. I knew the ABB have been covering The Weight on this tour, usually joined by someone from their opening act – Steve Winwood a week ago, Grace Potter on this night. I love The Weight (and love Grace Potter), but was hoping for a cover choice that was a little more creative. Everyone covers The Weight these days, so I was figuring it would be the usual sing-along, with too many people on stage to do any real damage. I was wrong. The Weight was one of the highlights of the night, an f----n’ freight train of a version that reinvented the song, taking it out of its little square box and stretching it into the kind of jam Joe Cocker and his Mad Englishmen used to do. Grace Potter is steeped in classic rock, but it was Haynes, Trucks and the ABB’s incomparable rhythm section that drove this train through the night. 6. I’ll party with the ABB crowd any day. There was plenty of partying, no shortage of recreational amusement, but no obnoxious assholes. Everyone was being nice to everyone around them. Maybe it was a good night or maybe it’s a fan base that has been around enough to know how to have a good time while still respecting whoever’s sitting around you. Makes for a nice night.